Mothagam is very Famous Neivedhyam Recipe on Vinayaka Chathurthi Recipe. Thengai Poorana Kozhukattai or Ulundu Kozhukattai are also 'Neivedhyam' for Lord Ganesh. Soak the rice min one hour & grind to a fine paste. Heat the pan add 1/4 cup water, 1 tbsp sesame oil, little salt , ground rice paste & cook well. Take the pan dry roast the channa dal & add the water & allow to boil until soft. Make it cool & drain it. Take a blender cooked channa dal,coconut ,cardamon, & grind to a fine paste. Heat the pan, add the ground paste, jaggery & allow to cook until soft think mixture. 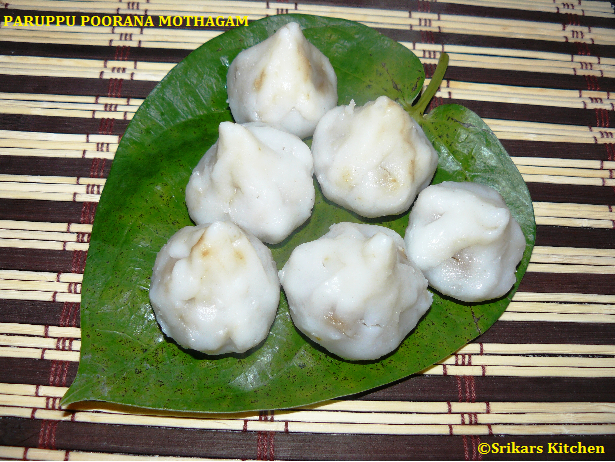 Take a rice flour & make a small balls & make like a cup and fill the paruppu pooranam & cover it as shown. Make all the mothagams & steam it for 5 min in a pressure cooker without whistle. Mothagam is ready now . I love pooranam kozhukattai a lot :) these looks super tempting and so perfectly made ! !